STAR Parenting is a powerful, focused approach to child guidance based on a star. 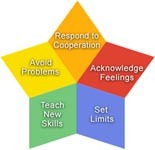 STAR Parenting gives you a problem-solving process, 5 general strategies, 3 practical tools for each strategy. There are three STAR Tools for each strategy or point – 15 parent-tested tools in all. These provide you with many ideas so you can find something that will work both for you and your children. can apply to common issues for toddlers, preschoolers, and school-aged children.